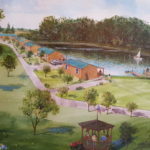 Home / Chariton IA Upcoming Events / Events / extended stay cabins / Fall Activities / Fishing / In the News / Lucas County Hunting / Motel Room Rental / Reception Hall Rental / Spring Activities / Summer Activities / Uncategorized / Winter ActivitiesCABIN LIFE, BIG FISH AND ROCK AND ROLL!!! You might ask what a cabin, big fish and rock and roll have in common. 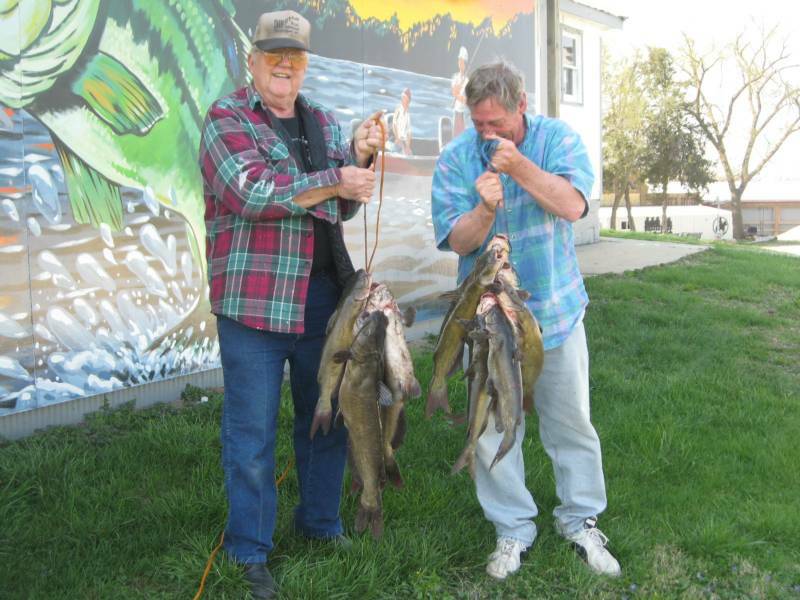 It’s all just an average weekend here in Chariton Iowa at Country Cabins Motel/Resort. 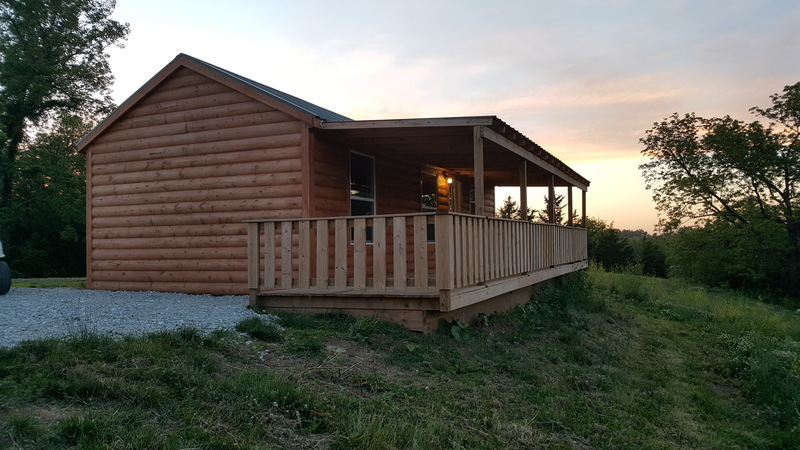 We just completed 3 more brand new cabins and they are ready for business. 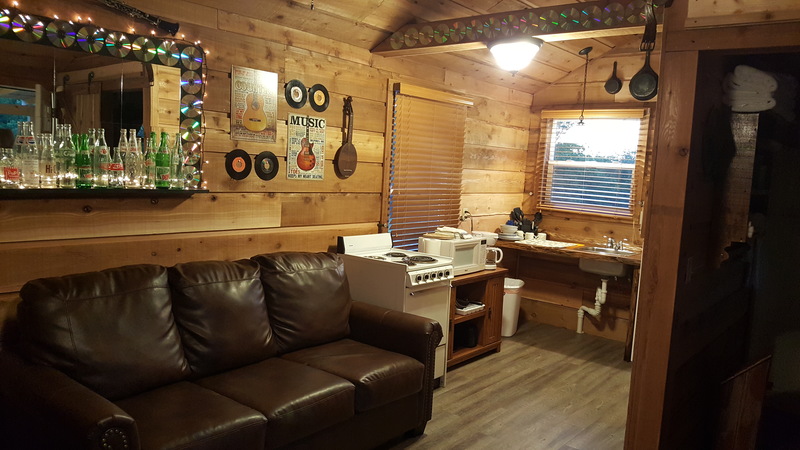 They all feature a 32′ covered deck, full kitchen and multiple beds for larger groups. 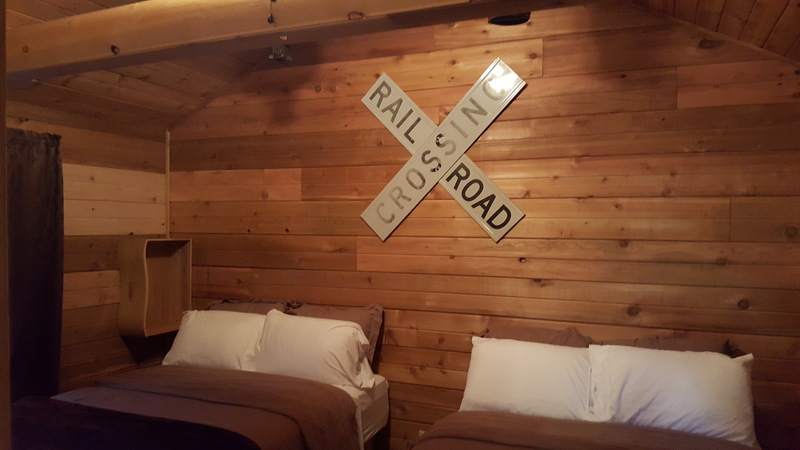 The first new cabin is railroad themed and named Yogi’s cabin after Yogi Shrader. With his wife, Joanne’s help, we have decorated it with some of their families’ collectibles. 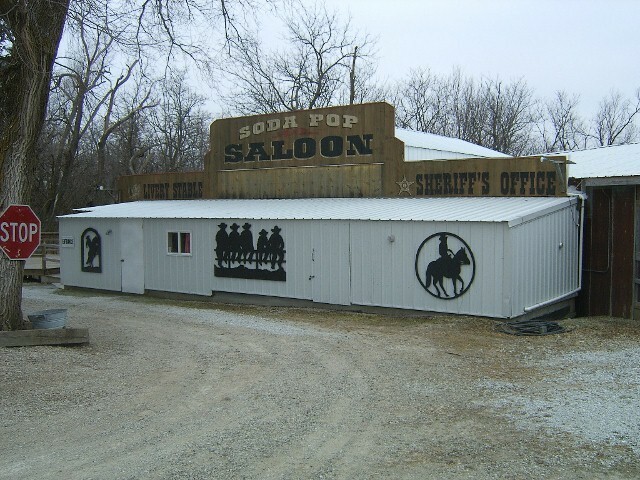 The second new cabin is themed after the Soda Pop Saloon which is located right next door to Country Cabins and offers live music and dancing each and every Saturday night from 7:30-10:30 from the first weekend in April-The end of October. 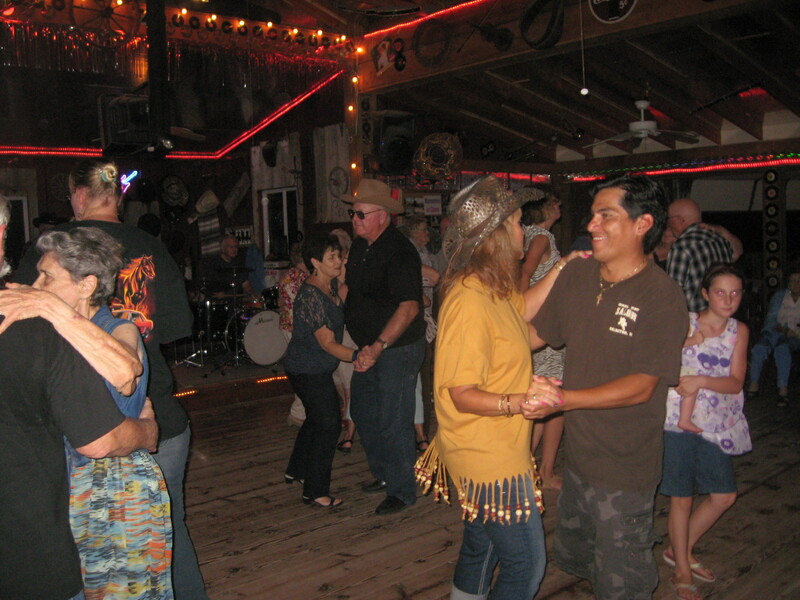 They have a great dance floor and serve delicious food. Sorry, no alcohol and it is family friendly so you can bring the entire family. Thanks to Fidel, Cindy and Christine for all their hard work decorating and helping to get the Soda Pop cabin up and going. It is very cute. It has separate bedroom with two full beds and leather sofa sleeper in living room. I does have a full kitchen and bath and 32′ covered deck. 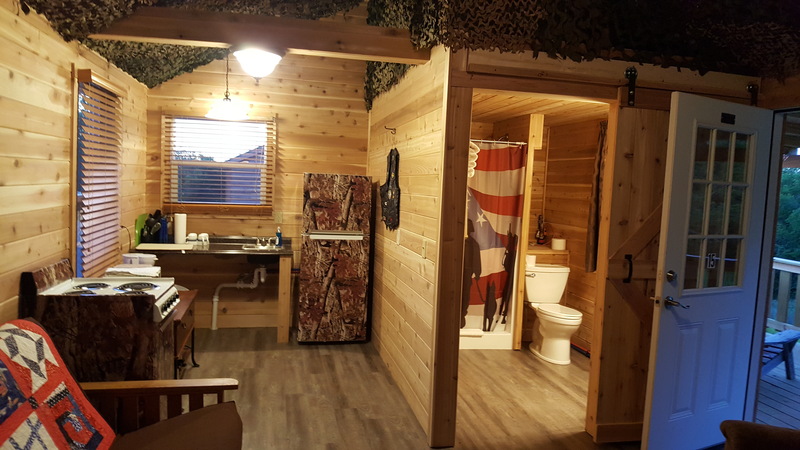 The third new cabin is our Military themed cabin and it turned out absolutely fantastic and is our Pride and Joy. We always give our Military Veterans a 10% discount any time they stay with us. 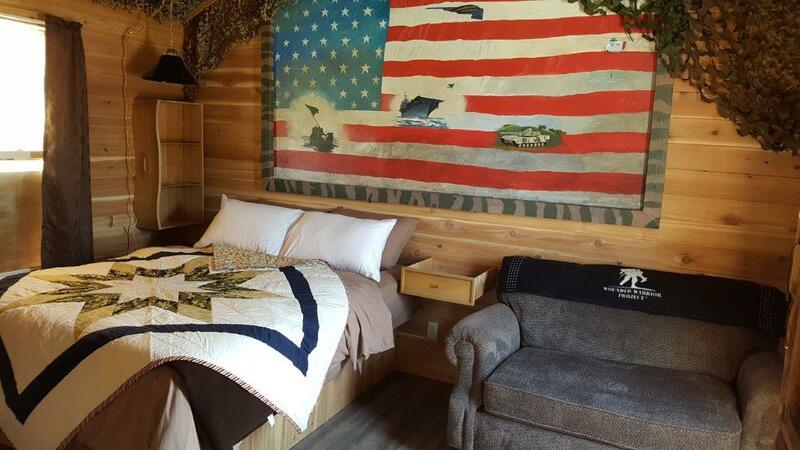 We also give one free night per week to a current or former military member in the cabin or suite of their choice. Click on picture to the left for great story done by Roger Riley on Channel 13 news last week. Now for the big fish story! We have 3 lakes surrounding Country Cabins and they are all great fishing and are stocked with crappie, bluegill, large mouth bass and catfish. 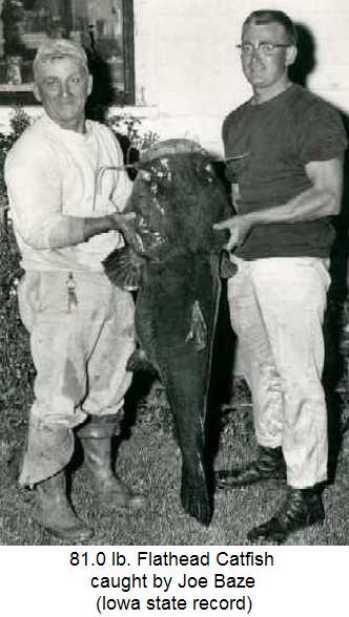 The Iowa State record flat head catfish in a fresh water lake was caught in Lake Ellis back in 1958 by Joe Baze and it is still the record today. We still have fishermen that have their lines snapped by huge cats when they walk down over the hill and throw in a line. The Hook, Line and Sinker bait and tackle shop is right next door for all your bait and tackle needs. Norm and Donna will fix you right up. We also have Red Haw State Park directly across the highway and they have a 62 acre lake there and several stocked ponds. Just over the hill is Lake Morris and it is 120 acres and has been the hot spot this year for bass, crappie and bluegill. All of these lakes are electric motor lakes only. As for the Rock and Roll, the first Saturday in June at the Soda Pop Saloon is 50’s night and you are invited to come in all your 50’s wardrobe for one of the favorite nights of the year. They have an excellent bunch of guest singers coming and lots of the good old days music planned for a fun evening. They still do play some good ol’ country also for some of us old fogies so we can do a little boot scootin’ as well. It is a fantastic time so bring the family and friends on out for a good time. So there you have it, Cabin Life, Big Fish and Rock and Roll! Come on out and give it a try as it will be the best fun you can imagine. We have mowed trails down to the lake and through the timber to the Trading Post. Once you arrive they offer mini-golf, soccer golf, antique barn, shopping and wine tasting, bait and tackle and live entertainment. All this in one place and they say there is nothing to do in Chariton Iowa! You don’t know what you are missing until you give us a visit. 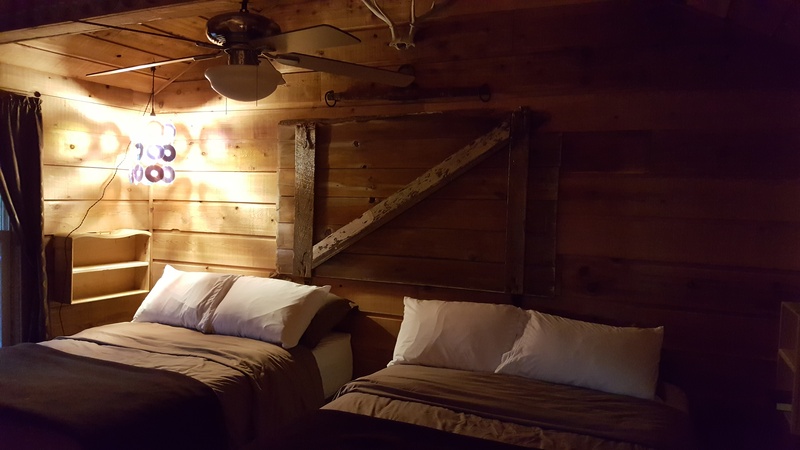 Stop by anytime for a tour of all our cabins and suites and check out all the different options and themes we have available. Southern Iowa’s hidden little gem is located just one mile east of town at the Frontier Trading Post and Country Cabins Resort. See you all soon!